I was really hoping this would be the solution, but I guess with how my vest lines up with where my nametag goes on my shirt, nothing will work. Even these pop off right away. I lost a backing within 4 hours of my first shift wearing them. Unfortunately, the item I ordered was substituted with a different type of holder that didn't work as well. The ones I received were plastic and they are not as effective as the leather ones are. Seat belts play havoc with your name plate or other pins on your uniform shirt. 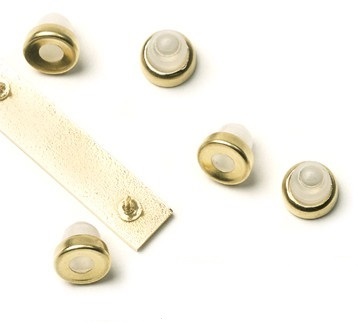 I've been using these fasteners to keep my uniform pins in place for the last couple of years of now without losing one. These are the best fasteners on the market. Being a Corrections Officer/Inmate Transport Officer, I can't afford things poping off my uniform in a struggle. I bought a package of these on a trial basis to replace my clinch fasteners. Boy do they work great! They do not pop off accidentally - period! You'll never go back to the clinch type fastener again! I purchased a package of fasteners from Quartermaster a while back. They are very dependable on duty, they hold my pins and nameplate securely. Not to mention, holds well in rough situations. Never lost fasteners! Thank you Quartermaster! I'm ordering an extra set. These are the best things I've found to keep name plate and service pins secured to uniform. Does fantastic job of keeping single pin items from spinning on shirt. I'm ordering my second set of fasteners since the work so well. I have used these for several months and have yet to have one come off. A great product. Q: How many fasteners come with each order?